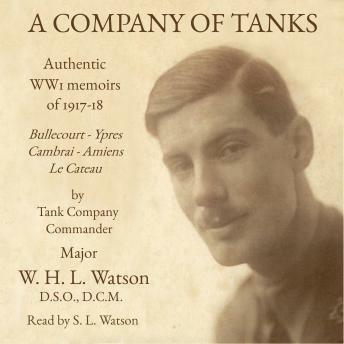 'A Company of Tanks', first published in 1920, is the final part of W H L Watson's memoirs of World War One. Watson, a young History graduate from Oxford University, enlisted as a Corporal in the Royal Engineers on the outbreak of the war and was sent over to France as a motorcycle despatch rider. In 1915 he published 'Adventures of a Despatch Rider' based on his letters home, but by then he had been promoted to Lieutenant and transferred to the Divisional Cyclists (known as the Gaspipe Cavalry because the cycle frame tubes resembled gas pipes). 'A Company of Tanks' picks up his story in October 1916, when Major Watson (as he had become) volunteered to join the Heavy Machine Gun Corps (as the Tank Corps was then called) and was placed in command of No. 11 Company, D Battalion. Watson tells how the tank crews trained by carrying dummy tanks of wood and canvas (to the great amusement of local children) before engaging in initially disastrous battles. At Bullecourt, tanks were delayed by a blizzard and then, conspicuous against snow, devastated by enemy fire that penetrated inadequate armour. In the Third Battle of Ypres they were bogged down in mud and gassed. Lessons were learned, and at Cambrai tanks began be used more sucessfully. At the end of 1917, after a bout of trench fever, Watson returned to England to form a company of 'Carrier Tanks' (used to provide logistical support on the battlefield) which he commanded in France until the end of the war. After the war, Watson joined the Civil Service and rose to high rank in the Ministry of Labour before his untimely death in 1932, at the age of 41. 'A Company of Tanks' is a personal memoir filled with details of the messy process of industrial war, with its tragedy and horror but also humour, people, landscape, food and drink. It will be of interest to professional historians or anyone interested in World War One. In this audiobook, it is read by Stephen Lowe Watson, a grandson of the author.